The Hands of Friendship quilt block shown was created using a monochrome colour palette. However, this would be a wonderful selection to use in a scrappy quilt as well. Once again, your imagination is the only limiting factor. 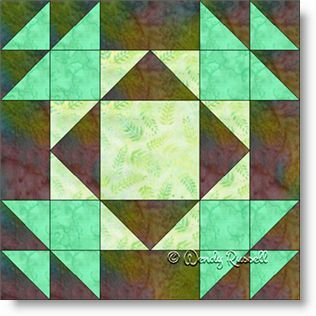 This nine patch quilt block is comprised of only two different patches, in addition to the simple square -- the half square triangle and flying geese units. Note how varied your quilt can look by the different setting you can choose, as illustrated in the sample quilt layouts shown.